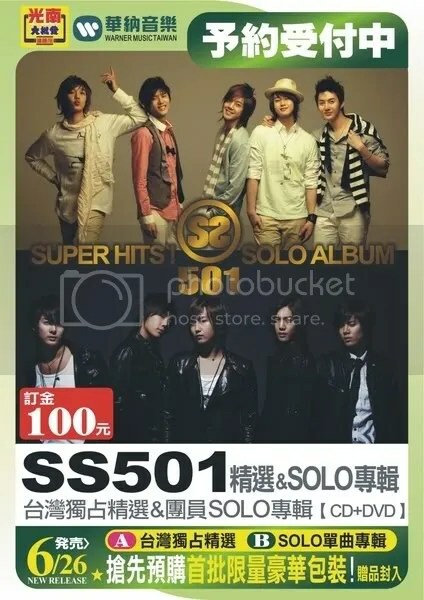 26th June SS501’s 1st release part 1 – Monopolizing Taiwan CD!! Limited 1st edition luxurious packaging comes with a gift pre-packed! 26th June SS501’s 1st release part 2 – Monopolizing Taiwan CD!! Creative “6 cover” design, to let fans who love all the members choose their own desired cover from among a group photo or individual photos of the members! each cd will be sold around NTD600-800..also, g-music is selling “1st story of SS501” for NTD1258 if i remember correctly..
*i am not responsible for the translation sounding weird..hehe..i did my best! they tend to use exaggerated terms so..
anyway, i’m going to taiwan (i think…) about a week after the cds are released..hope i can still get them..
the cd shop i got the info off is organizing a pre-order..i am sad i’m not born there..lol..any Taiwan quainters here? lol..
it’s good that they’re starting to promote SS501 over there..hopefully when (and if) SS501 comes to Singapore, it’ll be the same too! !